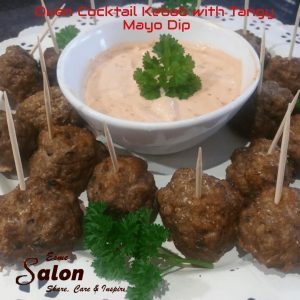 Oven Cocktail Kebab with Tangy Mayo Dip is an easy recipe with the juiciest and best cocktail kebab ever! Mix all together and drain well in a colander. Add oil in an oven tray and make small round cocktail size balls and bake in hot oven until golden brown at 180C plus minus 40 minutes. Mix ½ cup mayonnaise and ½ cup sweet chili sauce, and mix well.